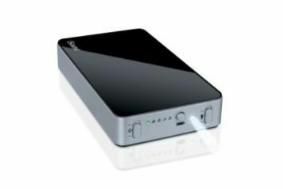 CES 2011: iSound launches range of charging products for portables | What Hi-Fi? And so it has proved for iSound - if you believe the marketing chaps on the stand - with the company's new Portable Power Max attracting plenty of attention. The device is small and light and fits in a (large) trouser pocket and contains a 16000 mAh battery capable of charging up to five devices over USB at once. The Portable Power Max can charge an iPad two times over before needing power and has an on/off switch, LED power indicator and... a flashlight. It will retail for $130 in the US but is due in the UK later this year. There will also be a smaller, less powerful version, the Portable Power, which is due on sale in the US for $80. In a similar vein there's the Power View Pro and Power View, $80 and $50. The former can play and charge two iPads, or iPods or iPhones, while the latter is only for iPod/iPhone. As well as two Apple dock connectors, the Power View Pro has two extra USB connections for charging yet more devices.